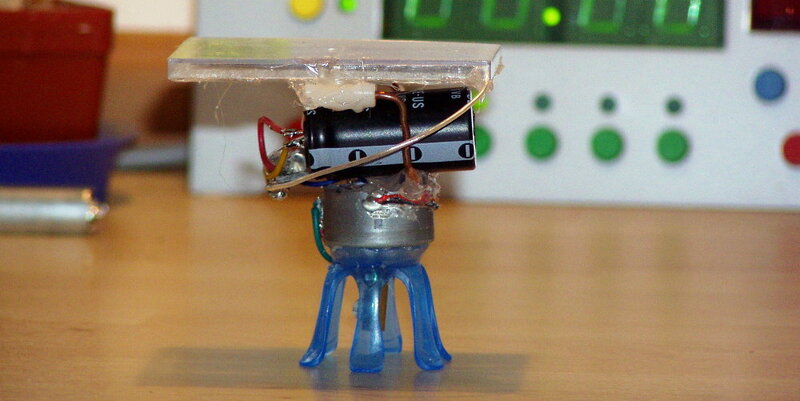 Chobot is a simple vibrobot with a photo-popper circuit. To get the required voltage of ~3V, it uses 6 solar cells in series. That's quite wasteful, but if you have enough cells, why not. Chobot moves using vibrations generated by spinning an asymmetric weight attached to a motor. It's not very efficient, but it works - somewhat. The legs are from some "Kinder Surprise" toy. Motor is from a CD-ROM drive (as usual - I have a good collection of those). 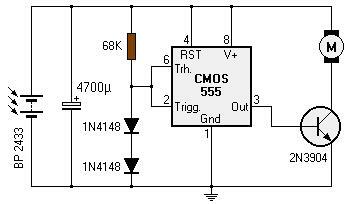 Chobot uses a photo-popper circuit with a CMOS version of NE555. The circuit works OK, but needs quite high voltage - that's why I had to use 6 solar cells. You can look for other similar circuits on this solarbotics page. The current from solar cells is rarely enough to power the motor. A photo-popper slowly charges a capacitor, and then connects it to the load and discharges it with higher current. When the cap is discharged and voltage drops below a lower treshold (~1.9V), motor is disconnected. Article published 2011-11-09 by Ondřej Hruška.